The marsh and wetlands vegetation along the Creole Nature Trail provide much more than beauty, mystery and serenity. This vegetation provides sustenance for millions of migrating birds that depend on it year after year. 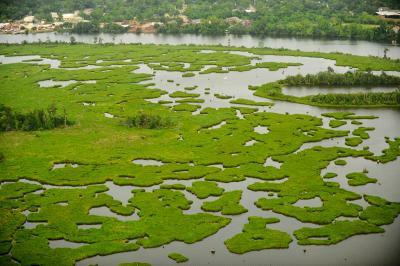 The abundance of marsh grasses serves other crucial purposes as well. They act as a buffer against storms by “breaking” the power of the storm surge and slowing down its inland path. And because the vegetation roots “cling” to the soil, the marsh grasses preserve the integrity of the marsh. Marsh grasses are an intrinsic and vital part of Louisiana’s Outback environment. They are incredibly varied and provide both food and shelter for birds. Shellfish breed in the tangled roots. Development poses the greatest risk to grasses along the Creole Nature Trail. Those at risk include the bluestem; switchgrass; Indiangrass; eastern gamagrass; brown-seed, thin and Florida paspalum; longspike tridens; pinewoods dropseed; gaping panicum; purple silkyscale; and gulf cordgrass. 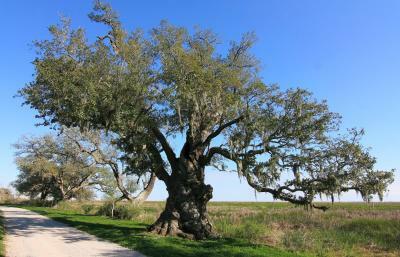 Driving south on Hwy 27 — either side of the Creole Nature Trail All-American Road — you will notice intermittent bands of higher ground, often topped by live oak trees and farms. Thousands of years ago, much of what is now Cameron Parish was completely submerged in the Gulf of Mexico. Over time, westward gulf currents carried huge quantities of Mississippi River silt and deposited it along the coast in ever-rising arcs that slowly rose to the surface. Solid land appeared creating a new coastline or beach. More time would pass then another more southerly coastline would emerge and so on for thousands of years. These “oak cheniers” as they are known in Louisiana’s Outback, are a rare phenomenon: former beaches isolated from the sea by strips of marsh. Cheniers farthest inland are the oldest. Because this land is elevated from the marsh and boasts remarkably fertile soil that is well watered, these oak cheniers have been used through the centuries for farming crops (including orange groves!) and cattle. Geologists believe the “youngest” cheniers — those closest to the Gulf — are more than over 1,200-years-old. The most significant cheniers are Grand Chenier, Front Ridge, Little Chenier, and Chenier Purdue. Maypop passionflower, woolly rose mallow and duck potato — you’ll find them all and many more throughout Louisiana&apos;s Outback. 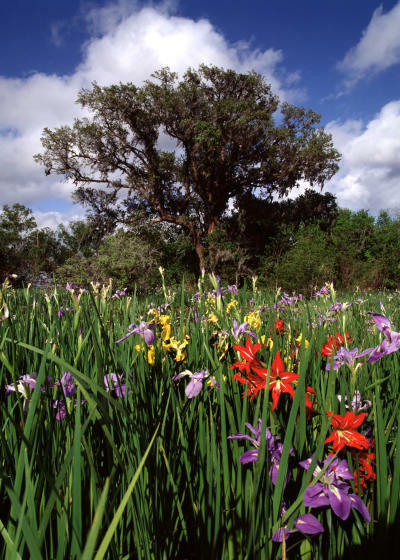 The Creole Nature Trail passes through terrain rich in bright, fragrant wildflowers that are far more than “just pretty faces.” Able to thrive with intense heat, the Creole Nature Trail’s wildflower population plays an active role in the ecosystem. Many are food sources for wildlife. Some provide food and other products for area residents. The maypop passionflower has an edible fruit, and other parts of the plant have medicinal uses. Cooking starches can be extracted from the roots of the common cattail, while the plant&apos;s spring shoots can be boiled and eaten like corn-on-the-cob. Spring and summer offer the brightest displays, but many species bloom from April through November.